I'm going to break this down "Barney Style" so if you are a mid to high level linux user, I apologize for it being so verbose. 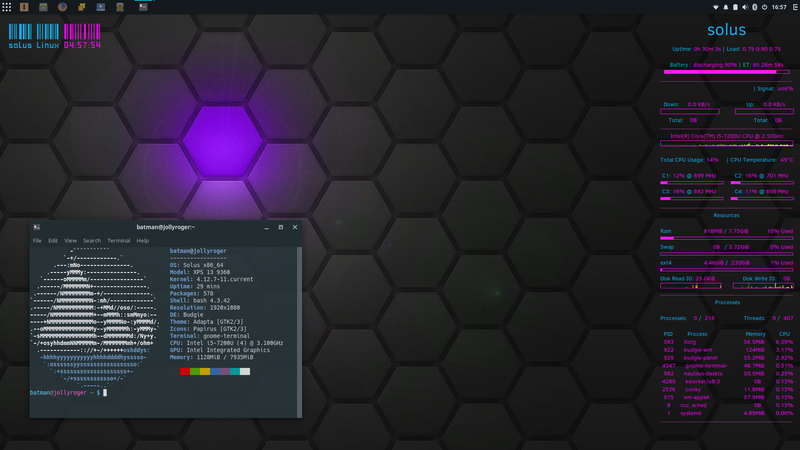 I modified a Conky script br_shadow was passing around on Reddit to have a more 80s theme and use the name of the current distro it was running. I also colorized the Binary Clock script in the upper left. What you need to do first is go into the Software center (repo) and install Conky and Conky Manager. Unzip it and put both the scripts in the .conky directory in your home directory. If you are using the file manager, to do this and don't know how to get into hidden .directories, go to your home directory in Files and hit control+h. If you are using the terminal just unzip them to ~/.conky and you should be good. Make sure when you unzip it that you take the scripts out of the directory they are in and deposit them directly in the .conky directory. Fire up Conky Manager and you should see ConkyCLOCK and ConkyWhat scripts. Toggle them on and you are good to go. Oh and you may want to go into preferences and set ConkyManager to launch at startup. I found this wallpaper in a r/wallpapers here. But I'd like to also recommend this wallpaper I found awhile ago. It is gorgeous with this setup. I can't figure out where I found the image from but I'd sure like to give them credit for something so striking. I think that's it. If you have any problems with any of this, drop me a line on my email found in the sidebar of my blog. Enjoy!